My tailor, Russell, recently lent me the tailoring book he was passed by his old boss at Kashket’s, the military tailors, when he retired. Dan and Russell still use it for reference on particularly unusual jobs like riding britches or certain coats. The book has no cover (the picture here is of a rather smarter edition). Its front is merely the beginning of Chapter 1 – Some Problems of the Tailoring Trade, by F. Chitham (Director, Harrods, Ltd.). Through good fortune and no doubt some decent treatment, this front page has survived without mark, despite the lack of a cover. And the back of the book is merely page 274 – the end of detailed descriptions on how to cut a West End Morning Coat. The book therefore has no title. 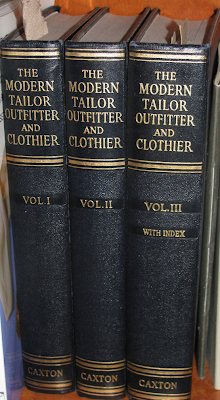 But through a little research, I have discovered that this is volume one of The Modern Tailor, Outfitter and Clothier, by A A Whife. Whife was the technical editor of The Tailor and Cutter, a trade magazine that was published from the 1850s until the 1960s. Volumes two and three apparently go into clerical dress, court dress and women’s wear. Which is probably why Russell only kept volume one. The fact that this is only the first volume also explains why there is no index. A reference system would seem to be indispensable for a guide like this, which aims to teach cutting in no small detail. As I read my way through this guide, expect occasional blog posts on interesting patterns and points. To start with, though, Mr Chitham’s introduction. It begins with the cheery note that “the Growing Competition to which the trade has been subjected … is the greatest problem of all, and is peculiar to the bespoke tailoring trade, in that it is a competition which threatens the very existence of many hundreds of persons engaged in the business.” The decline hasn’t stopped, really, since he wrote that a century ago. Though there are fewer hundreds threatened today. He goes on to recommend that tailors should not become too specialist, yet should concentrate on one ‘class’ of trade: “it is impossible to make a ‘cheap’ suit today and a ‘good’ suit tomorrow.” Some houses that have pulled back from ready-to-wear should perhaps have learned their lesson here. You can follow the discussion on The Modern Tailor, Outfitter and Clothier by entering your email address in the box below. You will then receive an email every time a new comment is added. These will also contain a link to a page where you can stop the alerts, and remove all of your related data from the site. Motivated by nothing more than a collector’s interest, I shall attempt to see if I can purchase a copy of the publication online – do let me know if you have any leads. Coincidentally, or maybe not, I own volumes II and III, but not volume I. Perhaps your friend flogged me the other two on ebay! Despite being an incomplete collection however they are fascinating to browse through, featuring as they do a picture of H.M. King Emperor George V in the “‘alternative dress’ for wear at Court”. Simon I know you’d adore the Chapter on ‘Correct dress for the occasion’. Alas I can only dream and fantasise about the patterns for waistcoats, motor liveries and clerical garments. But at least I shall never be caught out wearing the Knight Grand Cross Riband and Insignia of the Most Eminent Order of the Indian Empire on the wrong side! I have a full set of The Modern Tailor Outfitter and Clothier. 1949 Fourth Edition in Excellent Condition. They belonged to my Grandfather. I have them for sale on Ebay at the moment. Thanks for the shared your information with us nice information i found on your article.